For those of you not in the know about the huge swathe of culture known as videogaming, The Witcher 3 is an award-winning bestseller where you have involved adventures in a fantastical open world. This is a genre that is getting increasingly sophisticated, with vast, detailed environments populated by innumerable characters and creatures. A few years back, I wrote about the pleasures of exploring the world of Skyrim, notably following its resident foxes. The Witcher 3, which I finally got for my birthday back in September, isn’t quite so good with its ecology, but there I did encounter one wonderful detail recently. Not about wildlife, but about food. The sort of thing that really chimes with me and my baking obsession. So, your character, Geralt of Rivia, is attending a wedding celebration (while possessed by a ghost, no less. You probably don’t need any more detail). At the wedding, a mysterious character you’ve previously encountered makes an appearance. He’s called Gaunter O’Dimm, and he’s magical, knowledgeable and powerful. He talks about wishes, and I assume from his surname he’s some kind of djinn, or genie. I’ve not finished the game yet, so I’m not sure (and may never be). In this particularly scene, what nature of beast he is isn’t important – it’s his thoughts on baking. In the Medieval-style fantasy world of The Witcher 3, baking – even gingerbread – would involve yeast, or at least a natural leaven. But even with commercial, cultivated yeast, time is arguably the most important ingredient. Use too much yeast and rush the proving and the result will be overly gassy and hard on your guts, potentially leaving you feeling bloated or uncomfortable. Use less yeast and allow for a long prove, and the yeasts will have time to feed on the maltose in the flour, changing the chemical balance of the dough. The resulting baked bread will taste better and easily digestible. This is on the reasons people have trouble with supermarket “bread”. These industrial products do not respect the time factor. The dough is rushed in the industrial Chorleywood bread process, resulting in indigestible products the Real Bread Campaign and others have referred to as “pap”. Chorleywood is very much at the heart of our troubled relationship with bread these days. “Artisan” bakeries offer real bread, but it can be so expensive it seems an item only for the well-off. But don’t let this force you to eat pap – how about trying your own baking? People say, “Baking’s too time-consuming.” But this isn’t quite true – I tend to create a sponge, or pre-ferment, with water, yeast and about half of the total flour as the kids are having breakfast. This can then be left for hours, allowing the yeast to get a head start. I then make the dough with the rest of the flour and a dash of salt, then leave that alone for several hours. I usually then bake late afternoon or in the evening. Baking is more about a little bit of planning and can be fitted in around other activities – you know, work, childcare. It really is best to just leave the sponge and the dough alone for long periods, following Gaunter O’Dimm’s edict about the importance of the ingredient that is time. Once upon on a time in Britain, we grew our own grain, milled it locally, and used the flour to make bread in bakeries and village ovens across the land. These days, most of the flour we use for real bread* comes from North America and Central Asia. I’ve made bread with more locally grown flour before but never with locally grown flour made from landrace heritage wheat. So I was interested to hear from Michael Hanson of The Hearth pizzeria and bakehouse in Lewes, East Sussex (which recently featured in Dan Saladino’s Food Programme show about pizza) that he was using locally grown grain to make flour for their products. Michael has been using heritage grains in Hearth products for a while now. He’s friends with John Letts, a Canadian archaeobotanist and key figure in a movement to try and restore a diverse bank of British landrace grain varieties. Letts looked at the grains found in thatched roofs to learn what varieties were farmed around Britain, as the straw used in places dated back to Norman times. Michael now has a small crop of about 20 acres (8 hectares) of wheat, rye and barley at South Farm at Rodmell, just outside Lewes, utilising seed from Letts and the farming expertise of the owners, the Wetterns. Michael refers to the crop as a Sussex landrace mix including “maybe 40 or so varieties [of wheat], ditto the barley and rye, ancient varieties.” Michael’s also hoping to start a “micro-malting” operation from his base in the old Lewes bus depot. It’s certainly exciting – at least for people like me who are bakers, and into food provenance and history. Michael says they’re now using flour ground from the grain for the bread they sell in the Hearth bakehouse, as well as combining it with strong white flour to make the dough for the pizzeria. There can’t be many bakeries or pizzerias in Britain that can say that. It’s not exactly milled locally, being transported to Offley Watermill in Staffordshire. There are several working wind and watermills more local to Lewes, such as Ashcombe Mill near Kingston, or the watermill at Michelham Priory, or even the mill at Jimmy Page’s old house, Plumpton Place, but Offley offers expertise from the Howells, who have been milling in Stafford since 1840 and at this location since 1943. Michael said they’re “seventh generation millers”. He’s yet to find anyone with such qualifications locally. Incredible really, considering, again, about 150 years ago, every town and village had numerous mills. But what is the flour – stoneground, about 80% extraction – like to work with? Well, I must admit, I found it challenging. Some of today’s most respected bakers, like Chad Robertson of Tartine in San Francisco say, work wonders with ancient grains. But this whole question of making light, open-crust breads with low protein flours is tricky. As we’ve been getting much of our bread wheat in Britain from North American and Central Asia the past 150 years or so, our baking tradition has markedly changed. Due to climactic factors, wheats grown in Britain generally produced lower protein flours, “soft”. These foreign flours we’ve been using are from higher protein, “hard” wheat, and our baking has become dependent on it, has been shaped by it. When we learn to bake in Britain these days we’re told you need the high protein flours, so you can develop the gluten (gliadin and glutenin proteins) to give it structure. High protein flours can contain as much 15%, whereas lower protein flours (plain or all-purpose) generally contain around 10%. Tom, the baker at the Hearth bakehouse, reckons the Rodmell flour could be as low as 8% protein. Other countries, such as Italy, haven’t become so dependent on high protein flours. During my years in Rome I’d buy various farro flours from the farmers markets and made some very tasty breads with them, but they were mostly dense affairs. These days I do mostly use a mix of strong white, likely grown in Central Asia but stoneground in Dorset by Stoates, and spelt flours. Using Michael’s flour reminded me of my experiments in Italy with farro flours grown by umpteenth generation contadini (loosely, “peasants”) in the hills of Lazio. The 100% Rodmell flour bread I made (65% hydration, basic bulk fermentation) was very tasty, with a sweet, nutty flavour, but it was a dense proposition. The kids didn’t turn their noses up, but it was a hearty meal in itself (a valuable quality for peasants of old). My second attempt used 40% Michael’s flour, 60% Stoates strong white, and it’s great. Relatively open but even grain. This is perfect for the kids’ toast. Much as I love the wildly uneven, massively open grain you find in hip “artisan” breads and ciabatta say (ie high hydration dough breads), it’s not ideal for toast! Anyway, I reckon I could increase the mix to 50/50 with Michael’s flour. That’ll be my next test. In the meantime, it’s been wonderful to be part of this experiment to restore some Sussex landrace grain. Anyone else who fancies trying it, visit The Hearth in Lewes! Or if you’re a landowner, get in touch about growing your own grain! * That used in industrial pap is different matter. It’s an interesting story I’ve touched on before, but as pap – indigestible pseudo-bread made with the Chorleywood process – is such an execrable product I’m not talking about it again here. The expression “the best thing since sliced bread” is profoundly ironic. Grain is packed with nutrients, but plastic wrapped sliced “bread” is generally made with flour that’s been ground with hot steel rollers, which damage and degrade the nutrients, and then baked with the Chorleywood Bread Process (CBP), a heinously misguided mechanisation of the bread-making process developed in England in the 1950s. All that sliced, plastic-wrapped pseudo-bread they sell in supermarkets and cornershops is CBP product. It’s not bread. It’s an insult to bakers, to our baking heritage, to the farmers who husbanded grain over the centuries. It’s an insult to our constitutions. I’d always been lead to believe that the CBP was developed as two world wars, and a dependence on shipped grain, had seriously compromised British food security. The scientists at the British Baking Industries Research Association at Chorleywood wanted to both mechanise the bread-making process, making it faster (perhaps their greatest folly, see below) and wanted to be able to ease reliance on higher protein foreign wheats. They wanted to make bread again from the soft, lower protein wheats we could grow in Britain. Or at least, that was the story. It’s one that’s regularly trotted out, such as here, on the site of one of Britain’s biggest organic flour brands. 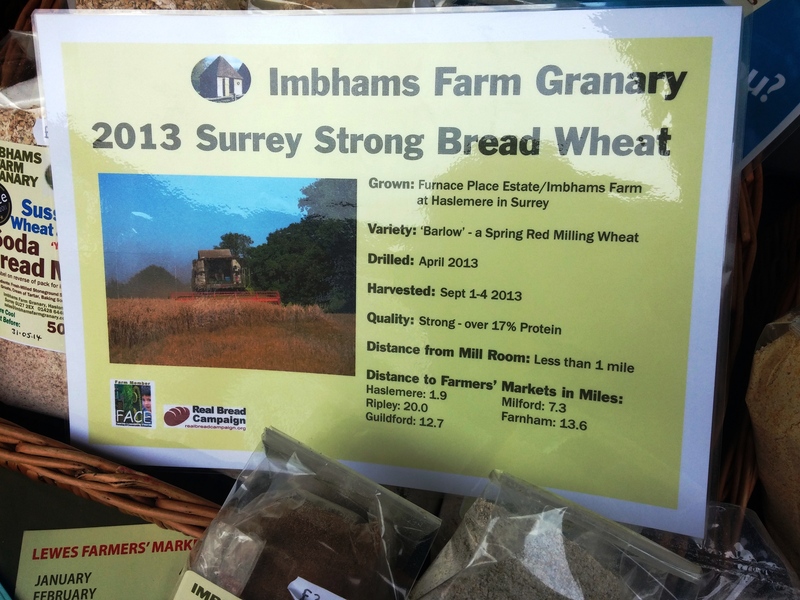 But last weekend I bought a bag of flour from the market stall of Imbhams Farm Granary. 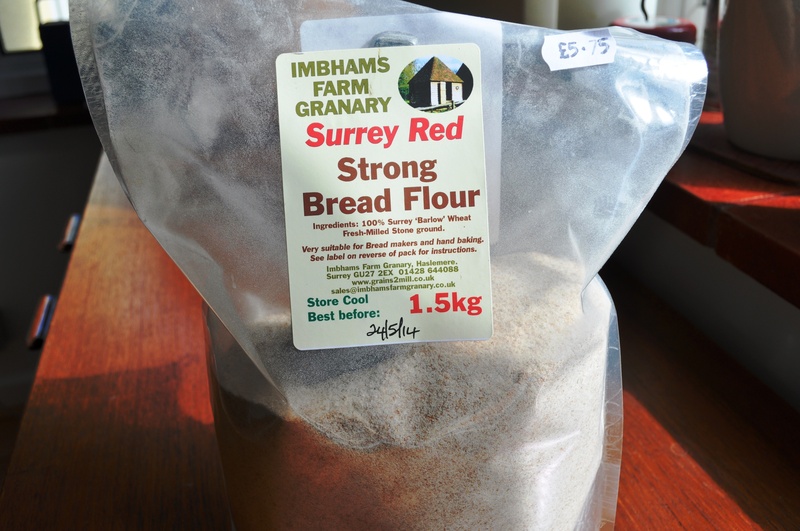 It was their latest batch of wheat flour, called Surrey Red Strong Bread Flour. (It’s called red because of pigments in the bran.) It was grown in Surrey, about 50 miles from Lewes, stone-ground to retain the nutrients at a mill a mile from the fields and, notably, very high in protein. The info sheet said 17%, James Halfhide of Imbhams quoted a figure slightly higher, and said it would be even higher if they sifted more of the bran out to make a lighter coloured, less wholegrain flour. For comparison, low protein plain or all-purpose flour might be 10-12%, strong bread flour about 13% plus. It’s Barlow wheat, a hard spring wheat developed recently2 in North Dakota in the US, but James said it grew very well here, especially in the excellent 2013 season. Which quite shocked me, after years of hearing the story – nay myth – that British wheat means low protein. 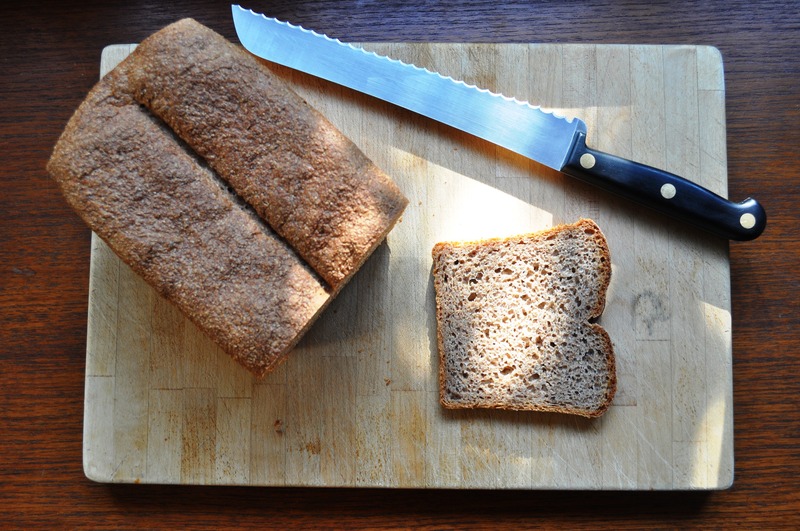 Although I like and make all sorts of bread, as the Imbhams farm flour is so wholesomely branny – and wheat bran is a great source of fibre, fatty acids, iron and other minerals and vitamins – I wanted to make a 100% wholegrain bread. 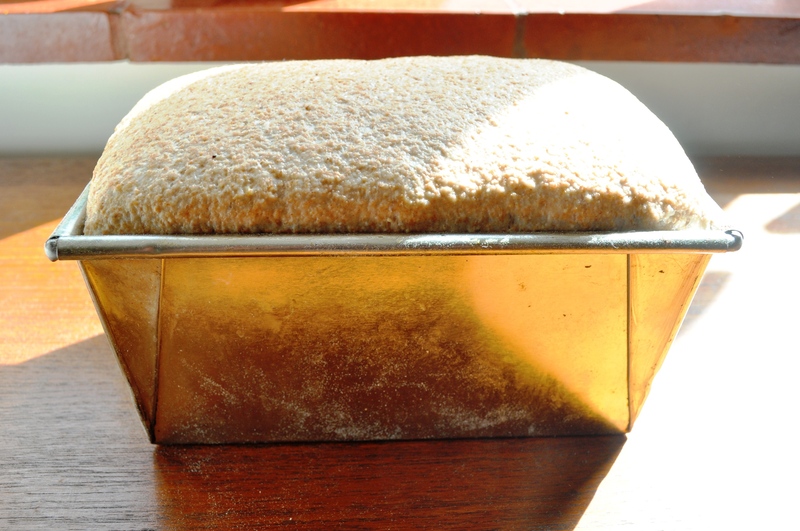 I also wanted to reduce the amount of yeast I usually use (10g to 500g of flour, or 2%, to about 6g to 500g of flour, or 1.2%) and do a longer fermentation – that all-important factor of bread production that the CBP neglects. Wheat needs long fermentation to be fully digestible – this whole rushed factor with CBP is the main reason so many people say they have dietary problems with wheat-based products these days. 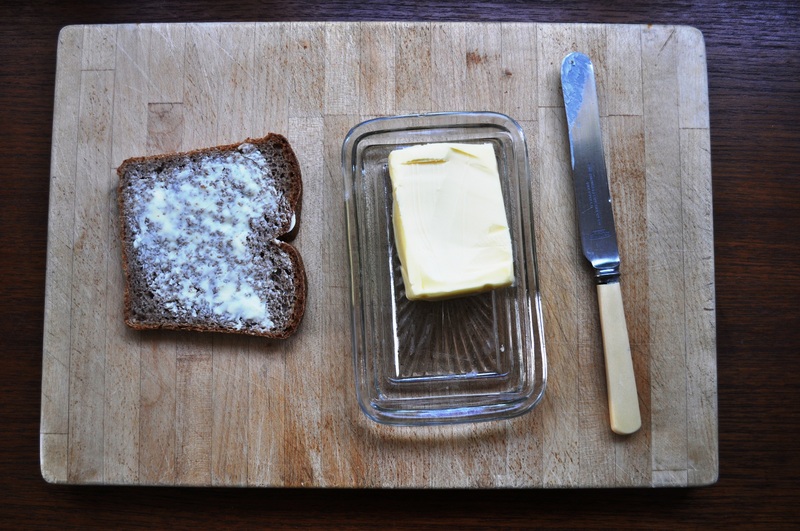 This is all you need to make real bread – these four ingredients. Indeed, arguably, you don’t even need commercial yeast, you could just cultivate your own leaven with flour and water and wild yeasts. 2. Put the flour and salt in a large bowl. 3. Add the yeasty water. 4. Bring together a dough. 5. Knead briefly then form a ball and leave to rest in the bowl, covered with a shower cap or cloth. 6. After 10 minutes, knead briefly again. 7. Rest, covered for another 10 minutes then knead briefly again. 8. Repeat this once or twice more. 9. Put the ball of dough back in the bowl, cover and leave to prove in a cool place. I gave mine a turn (that is, stretched and folded it) after an hour or so, then put it in the fridge for about 10 hours. 10. Remove from the fridge, form a ball, then rest for another 10 minutes. 11. Form a baton shape and put in a tin. 12. Give it a final prove, until about doubled in size and ready to bake. This is where mine went a big wrong (see below). 13. Bake at 220C for about 15 minutes then turn down to 200C and bake for another 25 minutes. 14. Remove the loaf from the tin. Tap the bottom – you want it to sound hollow. If you get a bit of a dull thud, put it back in the oven for another 10 minutes without the tin. 15. Remove and leave to cool – to allow the interior to finish its baking process – on a wire racking. So yes, I goofed slightly with the final prove, step 12. I left it a little long in the airing cupboard at about 24C, overproving it so that it deflated when I slashed the top and I didn’t get a nice oven-spring (that is, the final burst of yeast activity and dough growth when you put it in the oven). Deciding when the dough has proved enough and is ready to bake can be tricky. Many people say the to test is gently prod the dough and see if the indentation remains, but I’m not convinced by this, as it might indicate the dough is over-proved and the gluten structure is collapsing slightly. I think it’s better if your prod marks slow re-inflate. It’s not an exact science though and every dough is different, especially with different flours. There’s a good discussion here. 1. ‘Good Food and Drink in Sussex’, Fizz Carr, Snake River Press, 2008. It’s a nifty little book for those of us living in Sussex and interested in its food heritage. I wish she’d quoted her sources though, as I’m intrigued about these figures and this whole transformation of British agriculture in the late 19th and early 20th centuries. 2. So yes, it’s hardly a heritage variety of Triticum aestivum, bread wheat. But it’s locally grown, locally stoneground. 3. Yes, of course I’m imagining I can feel the nutrients going into my body, but it did just feel good and wholesome. I haven’t eaten CBP products of years, but remember feeling bloated and sluggish and sick and gastrically stuffed up when I did.